The expansive role of the pharmacy technicians in modern healthcare settings demands higher education and national certification. State legislature signed on January 4, 2017, will take effect on April 6, 2018, requiring Ohio’s pharmacy technicians to register with the State Board of Pharmacy. Along with new state requirements, prospective pharmacy technicians will also need to take note of new standards for certification to take effect in 2020. In a bid to raise the standards for certification, the PTCB will require candidates to complete an accredited pharmacy technician training program, a mandatory background check, and assent to the new continuing education requirements for recertification. The new standards from the state and national certifying agency reflect the increasing role technicians play in the timely delivery of medication and the overall administration of the pharmacy. Their role goes beyond dispensing medication, organizing and stocking pharmaceuticals, and answering patient questions. With adequate training, technicians take medication histories, follow-up with patients, and communicate with providers in the delivery of high quality and affordable products. Technicians also manage more of the pharmacy administration by maintaining patient profiles and resolving payment issues with insurance companies. The short-term pharmacy technician technical certificate program at Sinclair College is 18 to 20 credit hours. It prepares students to perform the technician and specialized skills that a pharmacy technician should have to work in a community, institutional, or mail order pharmacy. The curriculum is designed to deliver a clear understanding of basic pharmacology, computerized records, preparation of drug products, distributing medications, ethical principles, and recordkeeping. It also includes simulated experiences using computerized systems and workbooks. Course topics include written and oral communication, pharmacy computer systems, interpreting medication orders, types of drug distribution, medication terminology, drug formulations and conversions, handling infectious and hazardous materials, pharmaceutical calculations, drug classifications, and legal aspects of drug dispensing. Students have the option to complete a real-world experience in a local pharmacy. Students who select this option must complete a state and federal background check. Tuition for the 32-week program is $1,882. Books and supplies cost an additional $956. Brightwood College’s pharmacy technician program provides students with the knowledge, technical skills, and competencies to pursue entry-level employment in as a pharmacy technician. 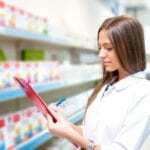 Students acquire the knowledge to transcribe prescription orders, prepare medication for dispensing, select drug products, label products, authorize refill and maintain computerized patient profiles. The program is 760 hours that runs for a duration of 36 weeks. It includes 550 hours of on-campus instruction and 210 hours of digital instruction. Students develop technical skills in the school’s mock retail pharmacy lab, which has weights, counting trays, a laminar flow hood, electronic scales, and mortars and pestles. In addition, students will be expected to complete a 200-hour pharmacy externship. Areas of study include fundamentals of allied health, introduction to allied health careers, academic strategies, body systems, hospital and retail pharmacy, sterile products, and pharmacy technician externship. Graduates receive a diploma in pharmacy technician and are eligible to sit the PTCB certification exam. Applicants must be 18 years or older at the program start date, provide official transcripts of high school and college coursework, and pass a criminal background check. Tuition for the program is $15,944. Students enrolled in the pharmacy technician program at American National University acquire the skills to work with pharmacists in the delivery of medication and health-related products. Students who successfully complete the program will receive a Pharmacy Technician Diploma and can take the next step in their career by taking the Certified Pharmacy Technician (CPhT) exam offered by the Pharmacy Technician Certification Board (PTCB). Additionally, graduates will have the training necessary to complete ANU’s associate’s degree in medical assisting. Experienced instructors will cover a wide range of topics including pharmaceutical calculations, IV preparations, basic chemistry, compounding, pharmacy procedures, pharmacy law, administration, billing and insurance, inventory, and much more. The program is offered as a flexible day or evening program. The school’s commitment to personalized instruction, provision of real-world experiences, and career services all help to ensure students’ success during the program and after completion. With full-time attendance, students will complete the program requirements in 10 months. Tuition for the program is $20,130 plus $2,700 for books and supplies.